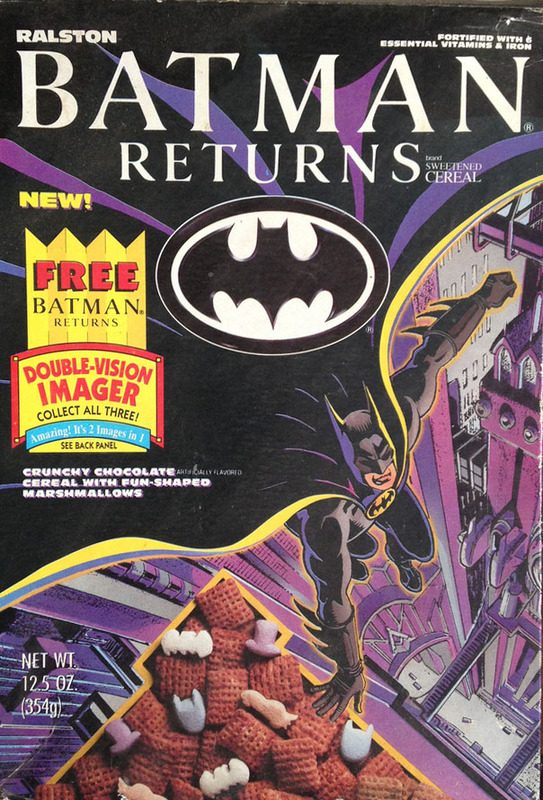 With the unprecedented success of the Batman film in 1989, a sequel was inevitable. 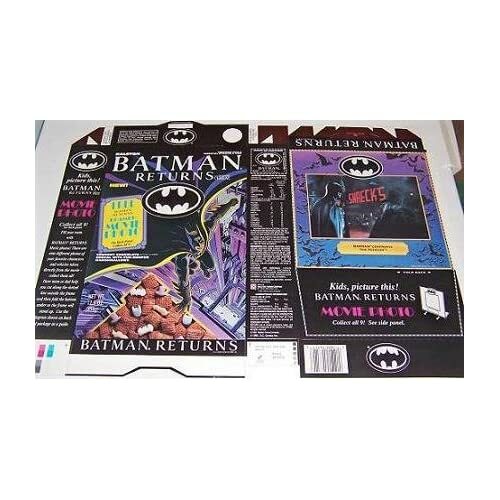 Warner Bros. originally wanted production on it to begin in 1990, but director Tim Burton was hesitant unless the sequel offered him something new and exciting. Warner decided to give Burton a large amount of creative control to entice his return. 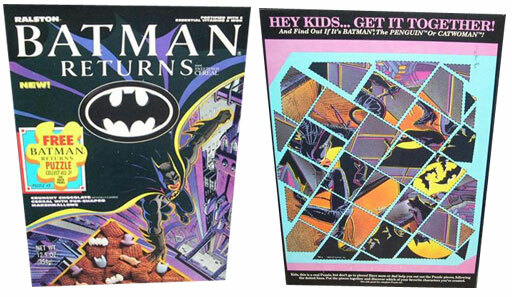 While Sam Hamm returned to write drafts of the screenplay with Batman co-creator Bob Kane back on board as a creative consultant, Burton wasn’t happy with it and commissioned Daniel Waters to rewrite it. 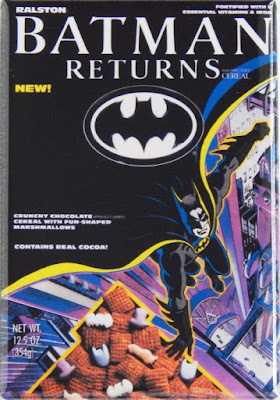 Batman Returns was largely inspired by the episodes “Hizzoner the Penguin” and “Dizzoner the Penguin” from the Adam West Batman TV series, wherein the villainous Penguin (Burgess Meredith in the show, Danny DeVito in the film) ran for mayor of Gotham City. This time, however, he would have the backing of crooked business man Max Shreck (Christopher Walken) and the help of secretary-turned-sociopath Catwoman (Michelle Pfeiffer). The film opned on June 19, 1992 and once again took the highest opening weekend record and became the third highest-grossing film of 1992. 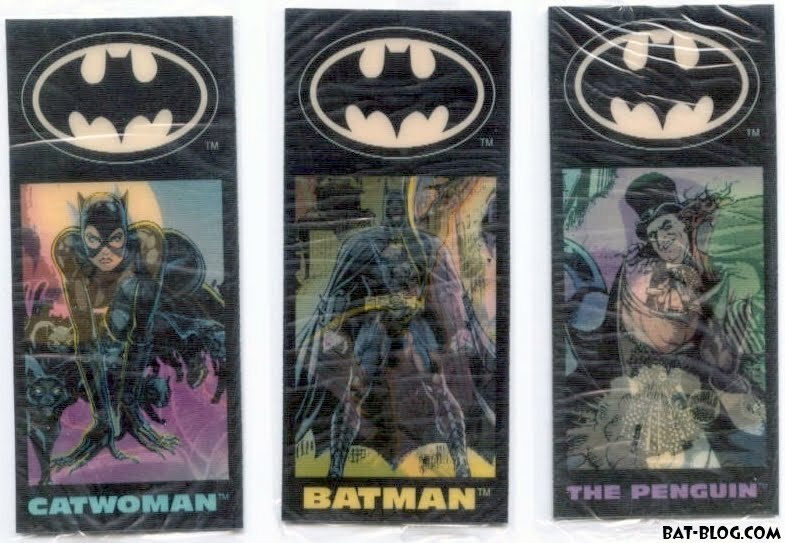 Glow-in-the-dark stickers and free toys? Score! 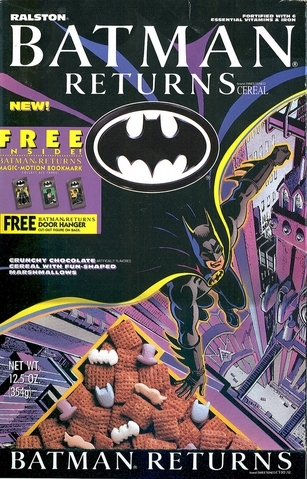 Once again Ralston was licensed to produce a cereal tie-in for the film, as they had with the previous one. However, instead of simply rebranding their original cereal, they decided to change things up. This time around, the cereal featured chocolate-flavored square pieces similar to those found in Chex with marshmallow shapes. The shapes were of Batman’s mask, his logo, the Batmobile and Penguin’s top hat. 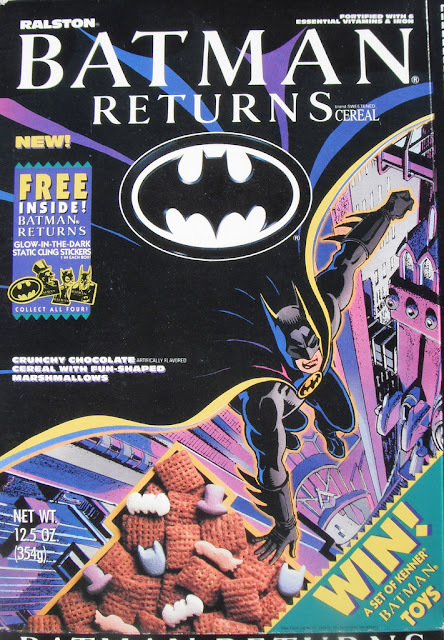 Premiums for the cereal included 3-D motion bookmarks with a door hanger that could be cut out of the back panel, a set of glow-in-the-dark static cling stickers, three puzzles that could be cut out of the box and assembled, six photos that could also be cut out and came on a foldable frame, and an offer for a set of action figures produced by Kenner.